If you’ve been looking to play Freddy Fazebear’s Pizzeria Simulator, but aren’t a huge fan of jump scares, there’s actually a way to complete a run with zero animatronic attacks. Granted, this saps all the fun out of the game, but it’s important to know that a “no jump scares” run is indeed possible. There are a variety of in-game conditions you must meet in order to complete your “no jump scares” run in Freddy Fazbear’s Pizzeria Simulator. Failing to meet all of these conditions could result in, you guessed it, a night where you get attacked. To help, we put together a comprehensive guide that will show you how to successfully avoid all animatronic attacks and complete the “no jump scares” run in Freddy Fazbear’s Pizzeria Simulator. Below, we'll show you how to complete a no jump scare run in Freddy Fazbear's Pizzeria Simulator. In order to successfully complete a “no jump scares” run in Freddy Fazbear’s Pizzeria Simulator and avoid all animatronic attacks, you’ll need to follow a strict list of in-game conditions. First and foremost, it’s important to note that pursuing this route in Freddy Fazbear’s Pizzeria Simulator will result in you receiving the game's “bad” ending. For more information on the game’s endings, be sure to check out our guide on how to unlock all endings in Freddy Fazbear’s Pizzeria Simulator. With that in mind, we’ve listed the conditions you MUST meet in order to avoid all animatronic attacks and complete a successful “no jump scares” run of Freddy Fazbear’s Pizzeria Simulator down below. To complete a no jump scare run, be sure to throw ALL salvage animatronics back into the alley in Freddy Fazbear's Pizzeria Simulator. 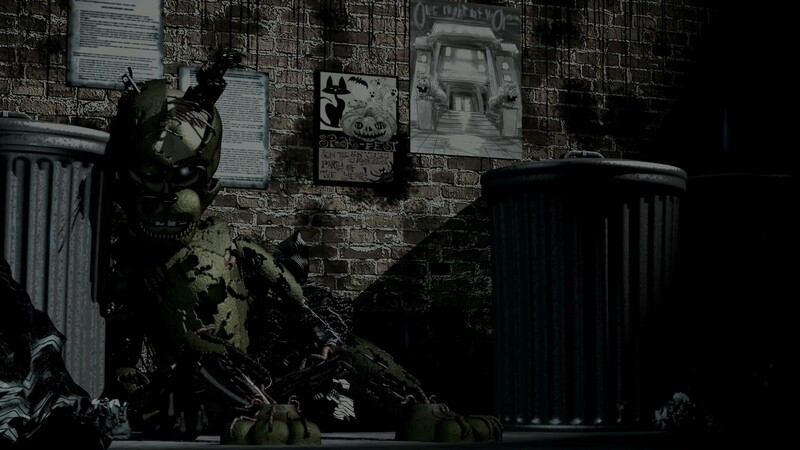 In Freddy Fazbear’s Pizzeria Simulator, you’re given the opportunity to salvage broken animatronics for parts. 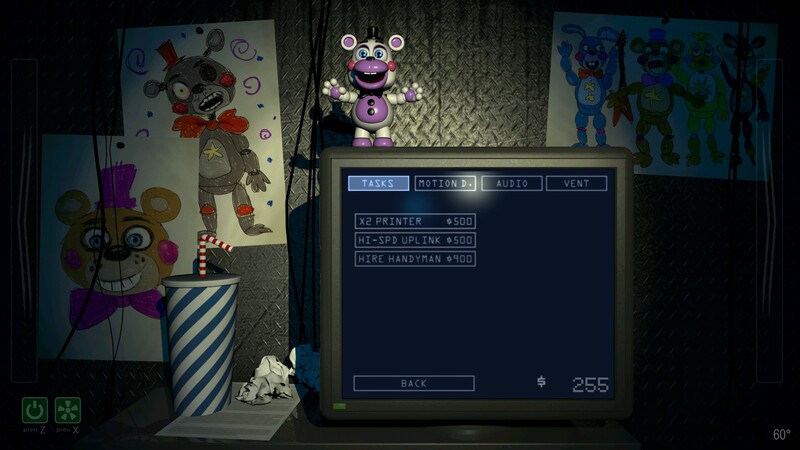 In order to salvage these animatronics, you’ll need to run through various sound prompts and document whether or not the animatronics respond. If the animatronic begins to show signs of aggression, you’re encouraged to use your taser to return them to a docile state. 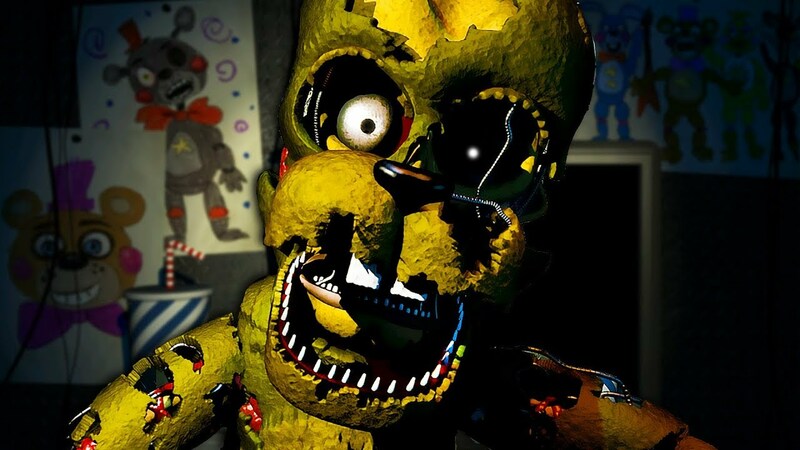 In order to avoid all animatronic attacks, though, you’ll want to play it safe and throw ALL salvages back into the alley where they came from. You should NEVER buy Lefty in Freddy Fazbear's Pizzeria Simulator. 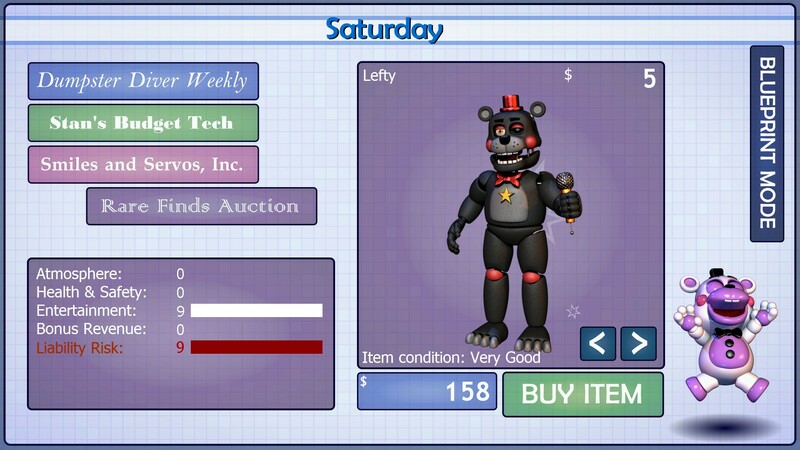 In Freddy Fazbear’s Pizzeria Simulator, there’s an animatronic named “Lefty” priced at $5 in the shop. Many players have learned this the hard way, but under no circumstances should you ever buy Lefty. This is because purchasing Lefty all but guarantees animatronic attacks in the middle of the night. In order to avoid animatronic attacks and successfully complete a “no jump scares” run, we strongly encourage you to NOT buy Lefty. Seriously, don’t do it. In Freddy Fazbear's Pizzeria Simulator, if you see an item that has been marked down in the shop catalog, do NOT buy it. 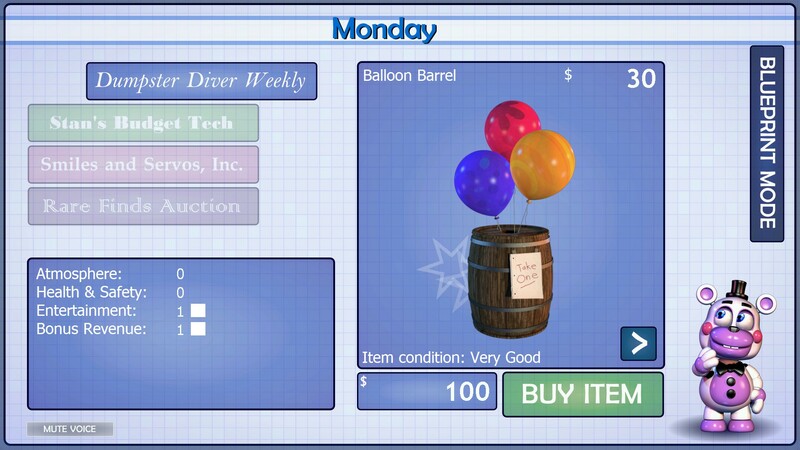 In Freddy Fazbear’s Pizzeria Simulator, the shop will have a variety of “marked down” items up for grabs. You may think these deals are incredible, and you may feel particularly inclined to purchase those items. However, every time you buy a marked down item, you run the risk of letting something loose inside your pizzeria. This is because unpleasant things can lurk within marked down items. In order to avoid all animatronic attacks and successfully complete a “no jump scares” run, do yourself a favor and avoid purchasing marked down items. It’s not worth the risk. 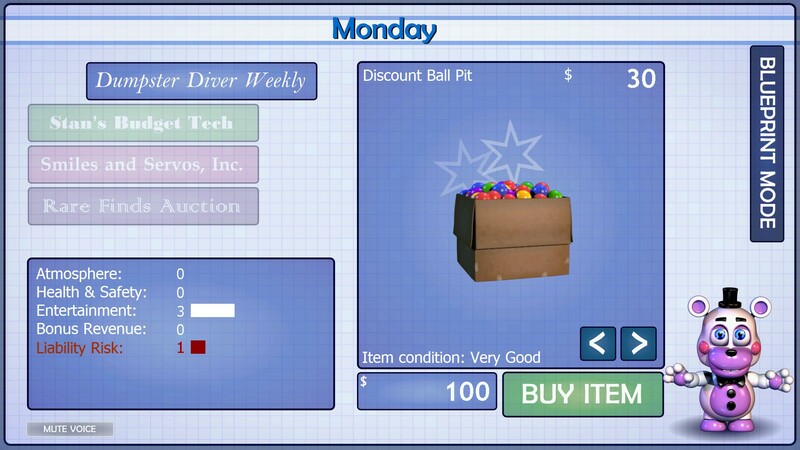 To stay on the safe side, avoid purchasing items with high Liability Risk in Freddy Fazbear's Pizzeria Simulator. In Freddy Fazbear’s Pizzeria Simulator, all items in the shop have stats that impact your pizzeria. While we can’t say for certain that buying items with high liability increases your risk of animatronic attacks and jump scares, our experience with Lefty has made us wary of these items. So, if you want to stay on the safe side of things, we recommend avoiding high liability items at all costs. By following the above in-game conditions, you should be able to avoid all animatronic attacks and successfully complete a “no jump scares” run in Freddy Fazbear’s Pizzeria Simulator. Follow the above conditions, and you should be able to avoid ALL animatronic attacks in Freddy Fazbear's Pizzeria Simulator. What’s nice about the "no jump scares" run is that you’re still able to unlock hidden lore found inside mini games (though you'll miss out on the game's "true" ending). To learn more about unlocking hidden lore, be sure to check out our guide on how to unlock hidden lore in all mini games of Freddy Fazbear’s Pizzeria Simulator. Again, we want to make it clear that pursuing the "no jump scares" option will result in you receiving the “bad” ending in Freddy Fazbear's Pizzeria Simulator. If you’re looking to unlock the full ending, be sure to check out our guide on how to unlock all endings in Freddy Fazbear’s Pizzeria Simulator. By reading through this guide, you should now know how to avoid all animatronic attacks and successfully complete a no jump scares run in Freddy Fazbear’s Pizzeria Simulator (FNAF6).